"Isn't steak supposed to be a man's job?" said Jason after chewing through a piece of practically raw meat. "How about *I* make us steak tomorrow?" he suggested with a devious smile. It's not often he gets sexists on me or makes fun of my cooking disasters. If the situation would not be completely absurd, I would consider being offended, but we both just couldn't stop laughing as I put the unfortunate rib-eye into the oven for the third time. To understand my steak saga, you have to understand an awful lot about me and about meat. I love a really great steak about 4 times a year. Any more than that and I get bored with beef, start gaining weight, and just don’t feel too good. But, cooking steak 4 times a year is hard on all accounts. Can you imagine the expectations? When I actually decide to cook steak, I want nothing but perfection. Well the perfection is hard to achieve when you cook steak once in 3 months. I find that there is a certain mystique around the concept of steak. I might make braises like boeuf bourguignon or osso bucco only once a year and they are perfect every time. But when it comes to cooking meats to medium-rare, I am in trouble. Just buying the right steak is a challenge. You have to know the difference between choice and prime, grass-fed and grain-fed, wet-aged and dry-aged. Then you have to decide between tenderloin, rib-eye, T-bone, NY strip, hanger, skirt, etc. Which one is most tender? Which one is most flavorful? Which one is the best of both worlds? Then there is the cooking temperature. Some people swear by high, some by low, some by high followed by low. There isn’t even agreement on how long to rest the meat. Opinions range from 2-10 minutes and from uncovered to tightly wrapped with foil and kitchen towels. Testing for doneness is the worst. It’s so easy for fish, separate the flakes, peek inside, and if only a trace of translucency remains, it’s done. The debates about doneness for steak are intense enough to start a religious war. Anywhere from 120F to 150F can be considered “medium-rare” depending on what you read. And how to test for this temperature is even more divisive. I used to be huge fan of instant read thermometers until the disaster last night. When I put the steak in the oven with a thermometer stuck into it sideways, I got a faulty reading due to my thermometer touching the side of the pan. “You have it easy!” I told Jason. “You’ve seen me make every possible steak mistake. Of course, your steak will come out better.” To tell you the truth, I sure hope it comes out better because I want this steak saga over with. We’ve been eating steak twice a week for the past two weeks and I am just sick of it, particularly that it wasn’t that great. But I just can’t give up on this steak quest. The engineer in me is determined to reduce this black art of steak cooking to a simple process that can be followed by anyone and doesn’t require eating steak on regular basis to master. Although I shouldn’t be helping my opponent, I’ll be generous, and share a few lessons I’ve learned so far. Jason, read carefully. 1) Rib-eye is a good compromise between tenderness and flavor. I don’t understand the hype about NY strip. I find it chewy and too dense. 2) Grass-fed beef tastes the best – most juicy, flavorful, and tender. It doesn’t really make sense since it’s leaner than grain-fed beef, but so far it’s been the winner. 3) Cooking steak on high heat the whole time makes it tough and unevenly cooked. Start out as high as possible to sear the outside, then finish in the oven. 4) When you put the steak in the oven, turn in half way through total cooking time. The pan is still hot from searing and the side of the steak that’s touching the pan will cook faster. 5) The oven temperature is still a mystery to me. I have a feeling that 250F for a long time, would result in the most tender steak, but I haven’t tried it yet, so I can’t say anything about the timing. 6) Don’t listen to Alton Brown about the estimated cooking time – that’s how we ended up with raw meat for dinner last night. 1-1/2 inch steak cooks longer than 5 minutes (1 minute sear + 4 minutes oven) that Alton suggests. My best estimate based on my previous mistakes is at least 9 minutes (1 minute sear + 8 minutes oven). I hope to come up with an estimated cooking time formula some day like I have for fish. My best guess so far is 6-8 minutes in 500F oven per inch of thickness for medium-rare. 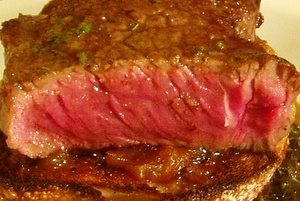 7) How do you know when it’s medium-rare? I don’t know exactly what works yet, but I know what doesn’t. Rule of thumb is complete BS. People like it so much because it’s cute. Even our instructor at CIA thought it was completely unreliable. Does meat get tougher when it cooks? Absolutely. But a medium-rare rib-eye will feel differently than a medium-rare tenderloin or hanger steak, and how does all that correspond to your thumb is a mystery to me and most professional chefs that I asked. When chefs poke meat to test it for doneness, they don't compare it to their thumb, but to how equivalent piece of meat felt last time they cooked it to that doneness. When you make 20 steaks per night you can develop that kind of intuition, but for someone who cooks steak 4 times a year, it's simply hopeless. 8) Theoretically, thermometer is a foolproof way of testing meat for doneness, unless you don’t stick it perfectly in the middle or a part of the probe touches the side of the pan, or the high tech equipment gods just aren’t with you. If using a thermometer don’t stick it into the meat and then put it in the oven. Even thermometers that are oven safe only do it well for large roasts. 9) I know it’s against all the conventional wisdom, but I don’t see anything wrong with making a small slit in the steak and peeking inside. I am guessing that if you want your steak medium-rare, you should take it off the heat when it’s rare. The very center should still be purple and raw looking. I haven’t tried this yet due to everyone’s concerns about lost juices, but the argument doesn’t make any sense to me. Do meat juices travel horizontally through the whole steak and leak out in the place where you made a cut? I don’t think there is much you can do about the loss of juices. People wish they could do something about it and they keep making up juice saving theories, like “sear the steak to seal in the juices” or “don’t make any cuts in the meat.” We have scientific evidence that the first statement is plain wrong and I wouldn’t be surprised if the second one is too. The reason you let the meat and fish rest is to even out the temperature. When you get it out of the oven, the outside is at 500F and the inside is at 120F. That’s just not a very good situation from the taste standpoint. Once you let it rest, the outside will cool and inside will warm up giving you a perfect 130F throughout. 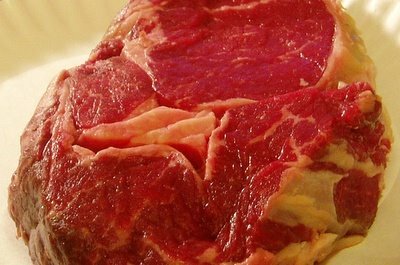 10) After taking the steak off the heat, remove it to a warm plate, cover steak tightly with foil and two layers of towels. This will retain as much heat as possible and help with the final temperature stabilization. Ok, man – show us how it’s done. And you must promise to show us how Jason does it if he succeeds! that steak looks near perfect to me. alton's method is pretty much the one i use to achieve a rare steak. adding a couple minutes in the oven should do the trick for med-rare. also, i prefer grain-fed to grass-fed. grass-fed tastes grassy to me. it definitely comes down to personal preference. I don't think the picture expressed just how raw this steak was. Pretty much all of the inside was still cool. I love a rare tenderloin, but a rare rib-eye felt too chewy at least if it's this thick. But I know what you mean -- people are very particular about their steaks and every one wants it slightly differently. Wow Helen! Thank you so much for the tips! I have struggled with this similar battle of the steaks and your wisdom will really help me out the next time I make steak! Thank you! I agree with dianka. I have trouble with steaks too, and this enlightened mi somehow. :) Thanks. Thermapen and tongs Use the tongs to lift the steak, then you can hit the center with the Thermapen held in the other hand. In 2 seconds you have the accurate temp. Take out of the oven at 130 degrees for medium rare and let rest loosely covered with aluminim foil for 5 minutes on a warmed plate. I put the plate in the oven for a minute or two while the steak is cooking to warm it. I share your steak problems almost exactly, so I'll be waiting for your solution (and Jason's, of course). 1) I've read somewhere that some chef (sorry about the poor memory) recommends the unorthodox method of cooking steak in a salt crust, as we do fish. 2) It may not be what you are looking for, but I've had much better success pan-frying my steaks after coating them in breadcrumbs (via eggs), which of course you could call a milanese or a Wienerschnitzel if you adhere to the respective traditional requirements. 1. Where to buy - Tom Thumb or Safeway, if you have one in the area. Their Ranchers' Reserve steaks are consistently great and reasonably affordable. 2. What to buy - I recommend ribeye, NY strip, or porterhouse. I know what you mean about some NY strips being tough, but theirs are not. Done properly, they taste like a leaner ribeye. 3. Preparation - This is for a steak cut 1 1/2 inches thick. Cover with olive oil and cook (or smoke - my preference) at 225 for 20 minutes. Then cover with seasonings of choice. I just use koshier salt and black pepper. Transfer to grill (on high) and sear for 1 minute per side, then move to cooling rack away from active burner (if gas grill) or heat (charcoal) for 5 minutes per side. Then let rest for 5 minutes. I just place the steak on a plate and set in microwave. This should be between medium rare and medium and should melt in your mouth. There are obviously other good methods, but I'm just telling you what works for me. Hope it goes well next time! I learned from Bobby Flay's program that you put a steak on the heat of choice. Then when you see droplets of blood on the top of the steak, its time to turn it and give it about 2-3 more minutes for medium rare. Works every time for me. Something about the blood pushing up when its ready.